aProf. 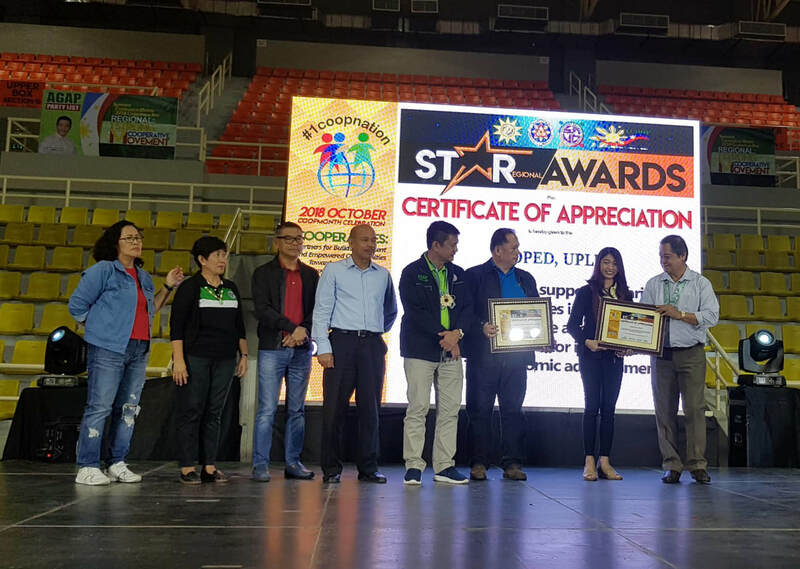 Quilloy receives ICOPED's Certificate of Recognition with Cong. Rico Geron (AGAP Partylist), Salvador Valeroso (CDA), Celia Atienza (LCDOP) and other organizers. 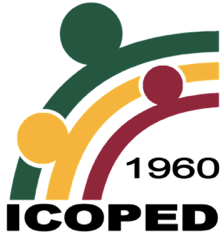 On behalf of ICOPED, Asst. 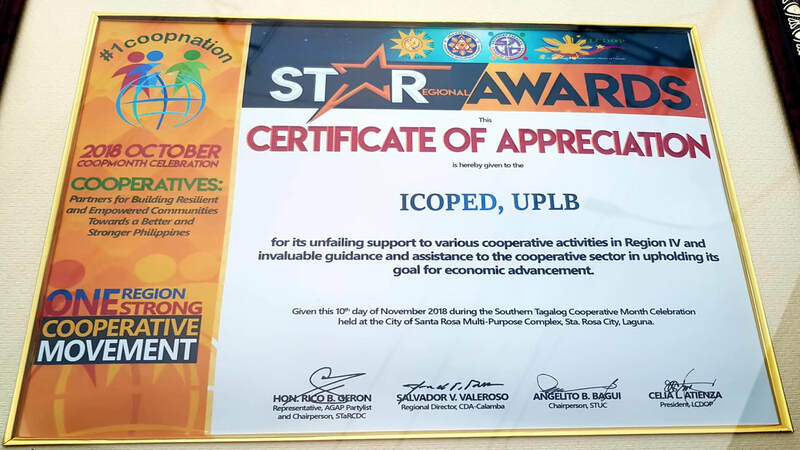 Prof. Karen P. Quilloy received the Certificate of Appreciation during the 2018 STARegional Awarding Ceremonies held in this city on 10 November 2018, which was part of the 2018 Regional COOPMONTH Celebration. Themed “Cooperatives: Partners for Building Resilient and Empowered Communities Towards a Better and Stronger Philippines” the event was organized by CDA Region IV, AGAP Partylist, Southern Tagalog Union of Cooperatives (STUC), and the League of Cooperative Development Officers of the Philippines (LCDOP). A regional Koop Quiz was also held prior to the awarding, where ICOPED, as represented by Mr. Paul Kenneth B. Maghirang, University Researcher, served as member of the Board of Judges. During the program, Senator Cynthia A. Villar delivered the Keynote Address while Senator Nancy S. Binay gave a short inspirational speech for the 5,000 delegates from various development cooperatives in Regions IV-A and IV-B. Supporting this year’s theme, “Makabagong Kooperatiba Para sa Kalikasan, Kapayapaan, Kaunlaran at Sang Katauhan” and its slogan, “Sa bawat henerasyon may progresibong rebolusyon; Rebolusyong Kooperatiba-Ngayon Na!,” ICOPED continues to promote and support cooperatives and their modernization by conducting its annual Youth Awareness Seminar on Cooperatives (YAS) and by hosting the Institute's triennial International Conference on Cooperatives (ICOOP), among others. Just recently, on 24 September 2018, ICOPED University Researchers, Ms. Alicia R Quicoy and Ms. Adriann M. Quilloy, conducted YAS for the University of the Philippines Los Baños (UPLB) students. The seminar covered topics on the history of cooperatives, status of cooperatives, types of cooperatives, cooperative values, and cooperative principles. A total of 79 UPLB students coming from the College of Economics and Management, College of Engineering and Agro-Industrial Technology, College of Arts and Sciences, College of Agriculture and Food Science, and College of Forestry and Natural Resources attended the seminar. Sharing of experiences on understanding financial statements from the participants was facilitated by Ms. Joan E. Mendoza. ​CLDD facilitators used a combination of interactive exercises, games, and lectures to enhance appreciation and understanding of the key concepts for cooperative management. The facilitators also conducted hands-on workshops in assessment and developing risk management plan in their respective cooperatives. The concepts and principles of Financial Management were discussed through interactive lectures in which participants brought their Annual Reports during discussion and workshop in interpreting income statement, balance sheets, and cash flow statement. The module on Internal Control covered topics on internal, external audit and effective internal control system. For this module, participants who are in the initial phase of operation, established cooperatives, and resource speakers exchanged learning and advises on solutions and alternative plans by established cooperatives and resource speakers. To enhance their learning, participants analyzed case studies and answered sample inventory questionnaire to be applied in their respective cooperatives. The participant from the Testech Group Employees Credit Cooperative presents their output on Risk Assessment. Mr. Paul Maghirang, delivering his talk during the CEM Seminar Series at ICOPED Auditorium, UPLB. Los Baños, Laguna – The Institute of Cooperatives and Bio-Enterprise Development (ICOPED) hosted the CEM Seminar Series last April 27, 2018 at the ICOPED Auditorium, CEM, UPLB. The resource speaker for the said seminar was ICOPED’s University Researcher, Paul Kenneth B. Maghirang. He discussed the continuance and switching behaviors of foreign subscribers on Korean mobile service providers. Results of his study showed that the formation of switching intentions within the users is greatly motivated by satisfaction level and perceived switching value. In addition, customers’ motivation on their continuous subscription are level of service quality, satisfaction, perceived switching value, and perceived switching cost. Since customers’ satisfaction tend to decrease when faced with attractive values from switching, service providers should maintain their excellent and consistent service quality to their clients. Moreover, service providers should establish relative advantage over competitors to accumulate switching benefits, thus, attracting, and luring away customers from their current provider. 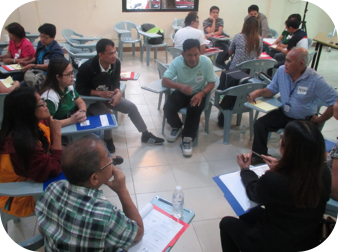 Los Baños, Laguna – The Institute of Cooperatives and Bio-Enterprise Development (ICOPED), College of Economics and Management, U.P Los Baños, in collaboration with the Municipal Cooperative Development Council (MCDC) of Los Baños, conducted the Training on Fundamentals of Cooperatives on March 26-27, 2018 at the Office of the Mayor, Municipal Government of Los Baños, Laguna. The training was in line with the new Cooperative Development Authority (CDA) training requirements for cooperative officers. Topics discussed during the first day of the training were the origin, philosophy and concepts of cooperatives and the cooperative laws, with Ms. Adriann M. Quilloy and Ms. Anselma A. Manila as resource persons. The lecture-discussions were complemented with activities such as application of the cooperative values and principles through role playing and a brief Q&A on the cooperative laws and its salient provisions to encourage active participation of the trainees. Asst. Prof. Karen P. Quilloy served as the speaker on the following day where she discussed the plans, programs and policies of cooperatives and the importance of strategic planning in cooperatives. She facilitated an experiential learning exercise through a puzzle visioning game and asked the participants to share the vision, mission and goals of their respective cooperatives through a poster making activity and presentation. 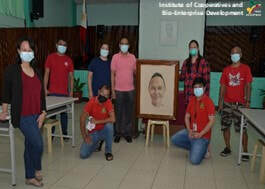 City of Cabuyao, Laguna - The Institute of Cooperatives and Bio-Enterprise Development (ICOPED) held the Risk Management and Credit Management Trainings for the Sumiden Employees Multipurpose Cooperative (SUMECO) in Cabuyao City, Laguna last March 17 and 24, respectively. SUMECO is a registered medium cooperative which was reorganized in 2012. SUMECO offers loan services such as personal, emergency, regular, special, collateralized, grocery, education, appliance and insurance to its members. As to date, the SUMECO has 1,300 members and targets more employees to join. Central in the training were hands-on workshops on cooperative risk identification and assessment as well as risk management planning. The trainees actively participated in the modified “Monopoly Savings Game” and role playing that were conducted by the resources speakers. SUMECO members dramatized the role of their credit committee, their credit process, and policies. The activities were followed by open forum and discussions among members and officers which gave them the opportunity to clarify concerns and raise suggestions regarding their cooperative services. 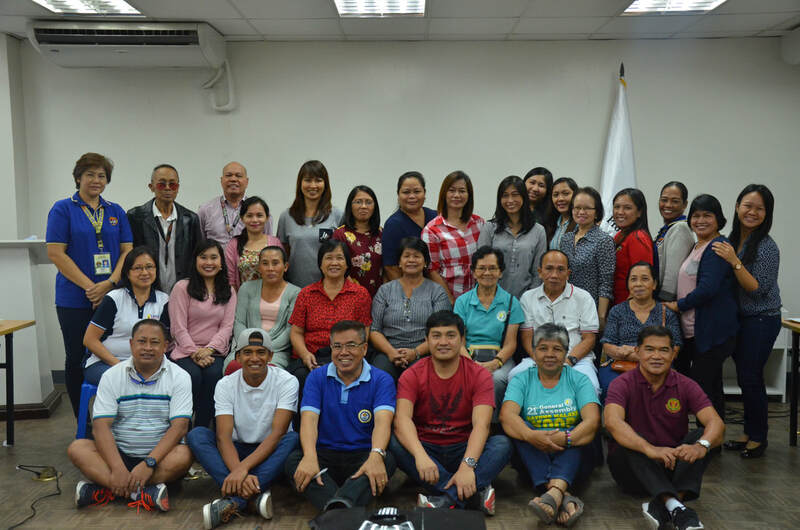 Los Baños, Laguna – The Institute of Cooperatives and Bio-Enterprise Development (ICOPED) conducted the Training on Basic Cooperative Management last February 27 and 28, 2018 at the Training Center for Tropical Resources and Ecosystems Sustainability (TREES), College of Forestry and Natural Resources, University of the Philippines, Los Baños, College, Laguna to orient current and future members of cooperatives on effective, efficient and sustainable management of a cooperative. The training was in collaboration with Rare Philippines, a non-government organization (NGO) focused on the promotion of sustainable natural resource management. The two-day training included topics on the fundamentals of cooperative principles and practices, organization and management of cooperatives, sources of capital for cooperatives, managing of cooperative enterprises, and project monitoring and evaluation which were discussed by selected faculty and staff of ICOPED and Department of Agribusiness Management and Entrepreneurship (DAME). The training concluded with a workshop where participants were grouped to summarize their learnings and demonstrated its application to their chosen cooperative enterprises through a short drama presentation. The first group, composed of participants from Rare Philippines, presented the possible role of Rare and local government units (LGUs) in the promotion of establishing fishermen cooperatives by highlighting the benefits such as tax exemption, better bargaining power and preferential rights in government and international grants. Further, the role of NGOs and LGUs in assisting potential fishermen cooperatives in the registration process and monitoring of operation and performance to ensure the success of these cooperatives was also emphasized. The other two groups, composed of LGUs and fishermen associations highlighted the importance of the values of self-help, self-responsibility, democracy, equality, equity and solidarity and the seven (7) cooperative principles in the effective, efficient and sustainable management of cooperatives. Los Baños, Laguna – The Institute of Cooperatives and Bio-Enterprise Development (ICOPED) conducted a Training of Trainers last November 7-10, 2017 at the ICOPED Auditorium, College of Economics and Management, UPLB. 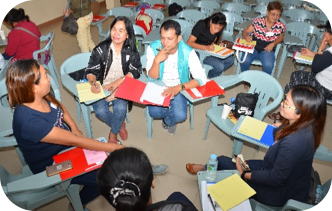 The training served as a refresher course for the CLDD which is one of the accredited training providers of the Cooperative Development Authority (CDA), and for members of the Calamba City Cooperative Development Council. The training course aimed to upgrade the existing knowledge, attitudes and skills of CLDD’s and the City Cooperative Development Council’s pool of trainers and would-be-trainers. 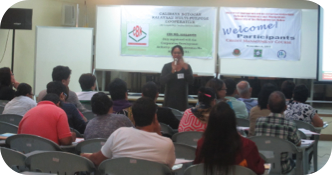 The participants were oriented and reviewed on the nature and present status of the Philippine cooperative sector as well as the importance of education and training as a principle of cooperatives. Throughout the course, the participants were guided in preparing session and module guides, going through the training cycle, and in formulating an action plan for cooperative training courses. The participants applied what they have learned during their micro-teaching session. They were also given the chance to experience being a trainer by being the designated hosts for the day. The resource persons for the said training were Ms. Alicia R. Quicoy, University Researcher; Ms. Anselma C. Manila and Ms. Arminga B. Peria, retired University Extension Specialist and University Researcher, respectively; Dr. JP Roma D. Domingo, University Extension Specialist; and Asst. 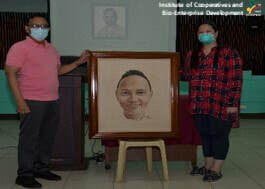 Professor Liezel S. Cruz of ICOPED. Dr. Mildred O. Moscoso, Assistant Professor, and Dr. Benjamina Paula G. Flor, Associate Professor from the College of Development Communication (CDC) also served as the resource persons. 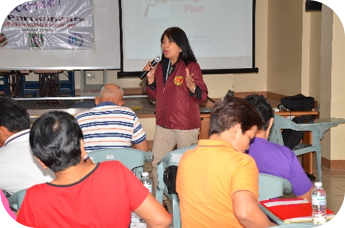 Kalayaan, Laguna - ICOPED conducted a Credit and Risk Management Training Courses last November 4 and 11, 2017 at Caliraya Botocan Kalayaan (CBK) Training Center Kalayaan, Laguna. 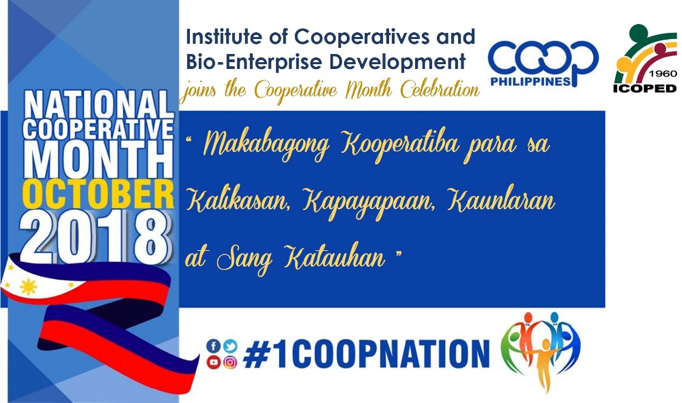 The said trainings are part of the “2017 Training Program for Cooperatives Officers and Members of CBK Multi-Purpose Cooperative” project of ICOPED in partnership with CBK, thru the College of Economics and Management Alumni Foundation, Inc. (CEMAFI). The training courses were facilitated by Dr. JP Roma D. Domingo, University Extension Specialist, and Ms. Alicia R. Quicoy, University Researcher, both from ICOPED. The courses covered topics on the concepts and principles of savings and credit as well as lending policies and its effective processes. Moreover, they also discussed the concepts, principles, and process of Risk Management as well as provided activities in identifying strategies on planning and evaluation of risks in their respective cooperatives.